A new 4-H community outreach series is underway. 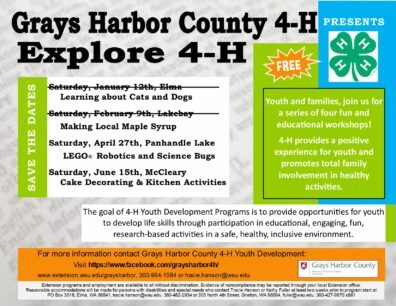 Please register by April 24th to join us for a free Explore 4-H LEGO Robotics and STEM session at 1:30 pm on Saturday, April 27th at Panhandle Lake 4-H Camp. This is your chance to learn about robots & science! The Explore 4-H series is free and open to 4-H members as well as families who are interested in learning more about 4-H.
– Preregistration is required. Please email tracie.hanson@wsu.edu or call Tracie at 360-482-2934 to register. Sessions are subject to cancellation due to low registration. The series is designed to give families a glimpse into different project areas as well as what 4-H has to offer youth and how youth and adults can get involved. Join us for one or all four of these free activities.